Could it be that my hands are in my lap, my elbows are locked, and there is absolutely NO elastic contact? Could it be I'm a horrible rider when I don't work with a trainer for a few weeks? No wonder he was bracing against me. I left the barn angry and upset for wasting half of my day off. OH MY GOD. Looking at that last picture of us cantering...probably the most embarrassing equestrian picture of me ever. I could have kissed his ears....I THANK GOD that my horse is the most forgiving creature ON EARTH. 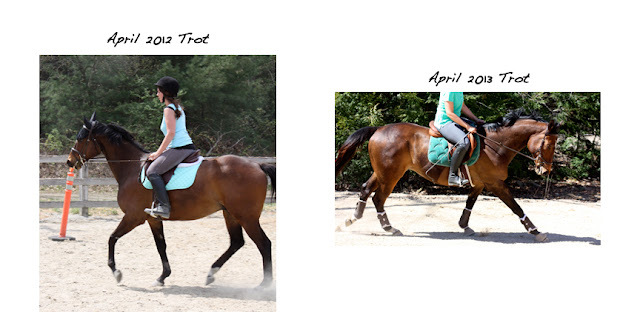 I would like to blame this on an ill fitting saddle that pitched me forward horribly, but it wasn't all that. But you know what, last April, I wasn't thinking about my horrible riding. I was just so happy to have a horse of my own. I didn't have that feeling of enjoyment at all today and that's really not fair to Finn. We've come so far together in a year. I've taken him from a rearing, green, out of shape TB, and have turned him into a happy, trusting, and (mostly) willing partner. 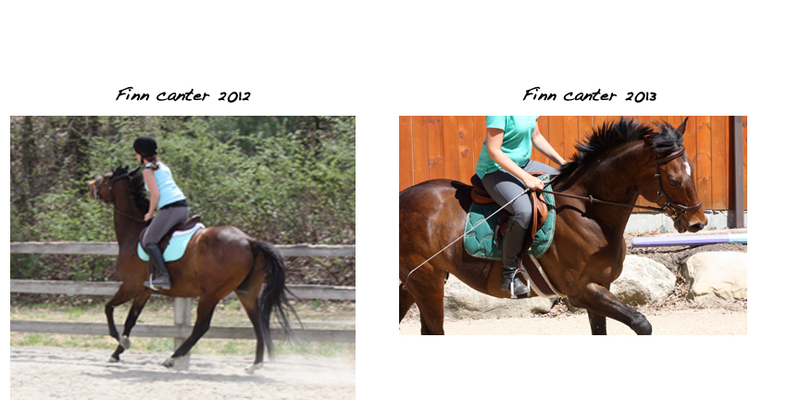 I've come a LONG way as a rider too, and to forget where we were to where we are now is something I don't want to do. I let today's ride ruin my whole day. We had some beautiful moments today amid the ugly. I really need to find a trainer to work with us for a month before we move. The trainer I loved, and had coming up weekly, can't anymore because she hasn't renewed her off property insurance. Surprisingly, it's pretty difficult to find an instructor with off property insurance to come give us lessons. Tomorrow afternoon it's back to the barn to apologize to my horse. The 2013 pics are super beautiful! You're definitely not a horrible rider. That's a big improvement!